I attended the the UBC Fashion Show on March 20, 2010 at the UBC Aquatic Centre, which was a pretty cool venue for the show. The runway was installed above the outdoor pool, which made for some interesting shots with the reflections in the water. The UBC International Relations Students Association presented the show, entitled "Fashion is Freedom," an exploration of the theme of fashion as art and how its expression reflects political freedom. The show featured the work of designers from Vancouver. UBC Fashion Show 2010 "Fashion is Freedom"
The first show, "Strapped" by designers Amanda Klassen and Neudis Abreu, Design students from Emily Carr University of Art, presented designs on the themes of consumerism and the depletion of non-renewable resources. The second show was "UBC Style" featuring campus fashions available at UBC, presented by fashion stylist Wilbur Tellez. The next show was by designer Nicole Bridger who uses natural fabrics made from renewable resources for her socially conscious designs. The fourth show was by Drew William who presented menswear and womenswear at the show. The next show was "Voicelessness," by designers Nicole M. Rosychuk, Lauren Mills and Mike Gouze and directed by Nicole Marie Rosychuk. Model Alina wearing an outfit of disposable coffee cups from "What Are You Wearing?" 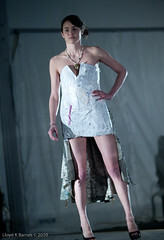 For more information and photos from the show check out UBC Fashion Shows on Facebook. so well. Your Website is well thought out, graphically impressive and Complete of great Assistance. Kudos. Maintain working and great job about the articles, I restarted once again and check your feed out quickly. We appreciate you this article, It was a fantastic read that was very helpful. Very helpful site. Thank you, very well written article.